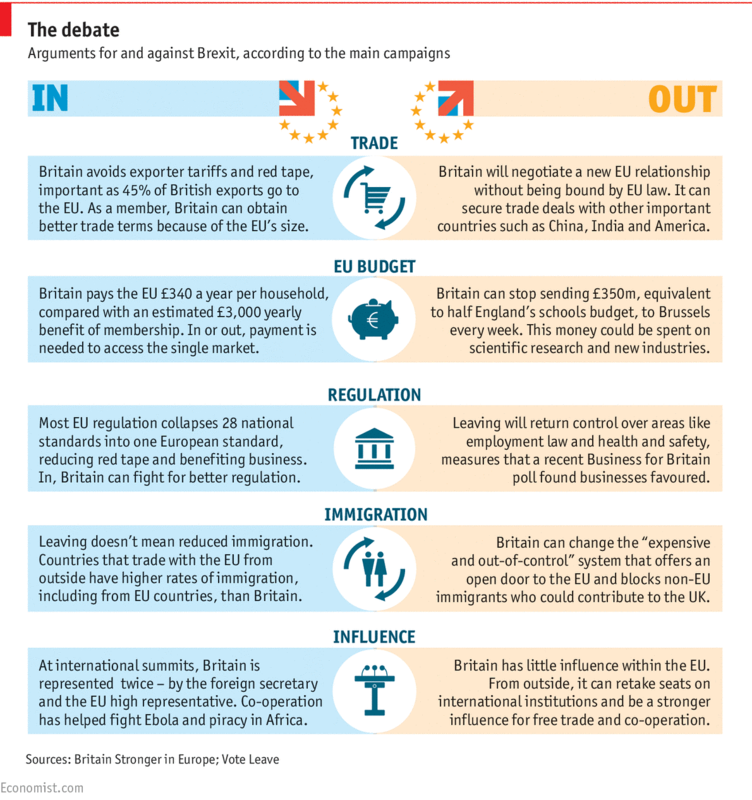 Scooper - Technology News: What would Brexit mean for the UK economy? The International Monetary Fund has warned that a British vote to leave the EU poses one of the biggest risks to the global recovery. But what would it mean for the UK economy? It may be, at first glance, a simple question but it certainly doesn’t have a simple answer. The economic impact of the United Kingdom leaving the European Union is not only difficult to assess, it is at the heart of the political argument for and against staying in the union. Although for many, the argument is primarily one of British sovereignty, those on both sides have used claims of the economic costs and benefits to support their cause. The World Economic Forum’s Global Agenda Council on Europe report on Europe's most important challenges identifies Brexit as a key issue for the entire continent – both politically and economically. A vote to leave would, it concludes, take the UK in to a period of profound domestic turmoil and that turmoil would extend to the rest of the EU as well. A lot is resting on the claims of the Leave and Remain camps. So what are others saying about the financial impact? With Prime Minister David Cameron campaigning to stay in the EU, you would expect the British government to be making the economic case to remain. A report by the Treasury says that Britain's national income could be 6% smaller by 2030 if the UK exits the EU. It calculates that the cut in GDP would be about £4,300 a year for every household. The Vote Leave campaign has described the report as "erroneous". Another official study published by the government warns that if the UK leaves the EU "huge numbers of British companies with supply chains in Europe would suffer". The report looks at the range of alternatives to remaining in the EU, including arrangements used by countries like Norway, Switzerland and Canada and concludes that "Britain would be weaker, less safe and worse off outside the EU". The Confederation of British Industry commissioned Price Waterhouse Coopers to assess the economic impact of Brexit. The report found that the importance of EU/UK trade meant that an uncertain future for British industry in the event of Brexit could knock up to 5% off the UK’s GDP, moving the country close to recession for several years. The study concluded that even if the UK was able to negotiate a free trade agreement with the EU, the economy would be 3% smaller by 2020. 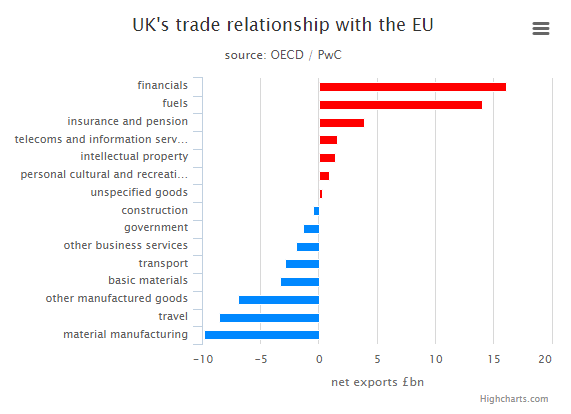 The CBI, which has voiced strong support for EU membership , has used the data from PwC to repeat its warning that businesses will be left vulnerable to trade obstacles and a shaky economy outside of the bloc. “The savings from reduced EU budget contributions and regulation are greatly outweighed by the negative impact on trade and investment. Even in the best case this would cause a serious shock to the UK economy,” said Carolyn Fairbairn, director general of the CBI. The longer-term outlook is brighter though. PwC estimates that average income per capita would still rise considerably by 2030, increasing by up to 39% on current levels compared to a 41% rise if we remain in the EU, once the immediate uncertainty fades. In its latest global growth forecast , the International Monetary Fund warned that Brexit could cause "severe regional and global damage". If Britain voted to leave, this would disrupt established trading relationships and cause "major challenges" for both the UK and the rest of Europe, it said. The ratings agency Moody’s has said that the economic costs of Britain leaving the European Union would outweigh the benefits and may put the UK’s Aa1 credit rating at risk. The agency said if Britain voted to leave the EU it would lead to heightened uncertainty which would result in “modestly weaker” economic growth over the medium term. The agency also said it was unlikely that the UK’s existing arrangements with the EU in areas such as trade would be replicated in full and any efforts to introduce trade barriers by remaining EU states would hurt many UK industries, such as car manufacturing. The Centre for Economic Performance is an interdisciplinary research centre at the London School of Economics Research Laboratory. It is one of the leading economic research groups in Europe. 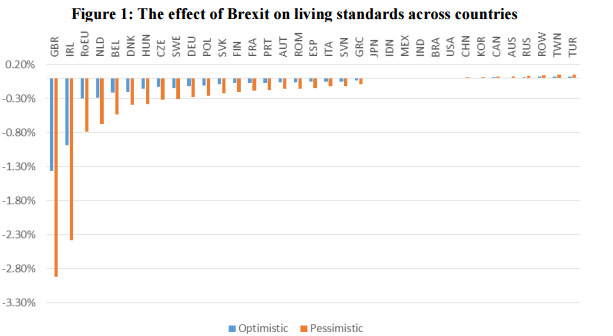 In a study of the effects of Brexit, CEP found that the most "optimistic" post-Brexit scenario for UK trade, in which the country adopts Norway's model and remains part of the European Union single market, would see average incomes fall by £850 per household. But at the more pessimistic end of predictions, loss of income from reduced trade and lower productivity could be as high as £6,400 per household, which is similar to the decline in UK GDP during the global financial crisis in 2008-09. CEP also looked at the effect of Brexit on other countries. It found that all EU members would be worse off, with Ireland suffering the largest proportional losses, alongside the Netherlands and Belgium. Some countries outside the EU, such as Russia and Turkey, gain as trade is diverted towards them and away from the EU. Most British banks have hinted that Britain should stay in the EU, including Barclays, which said in a statement that it was in the best interest of its customers. However, it has also said there could be benefits. After leaving the EU, the UK could become a " safe haven " amid a disintegrating Europe, according to analysis from the bank. The analysis said a leave vote would open a "Pandora's Box" in the crisis-hit continent, and could dissuade Scotland from breaking away from the relative safety of the UK. Barclays said financial markets had failed to grasp the sheer "breadth" of the British vote, calling it one of "the most significant global risks of the year", and one which could lead to the collapse of the European project. One of Britain’s most influential fund managers has said a British withdrawal from the EU would have no long-term negative impact on the UK economy and could even benefit it in the short term. There is a huge amount of information and opinion competing for attention in the Brexit debate. Much of the analysis hinges on what kind of trade deals the United Kingdom could negotiate upon leaving the EU. A lack of certainty on this means that, inevitably, there is a lack of certainty over the overall economic impact. The reality is that the economic cost may not be the most important issue for many Britons voting in June’s referendum. The assessments of many organizations that Brexit would negatively impact the UK may hold little sway for those determined to wrest back political power from Brussels.